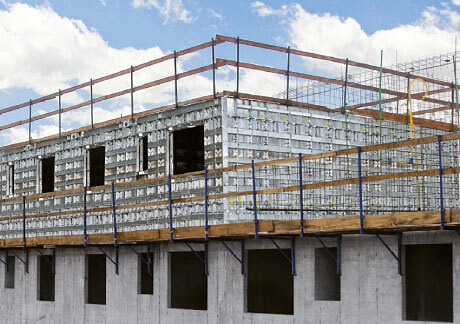 Doka One­Go is a high-per­form­ing formwork sys­tem for cast­ing walls and floors quick­ly in just one op­er­a­tion. 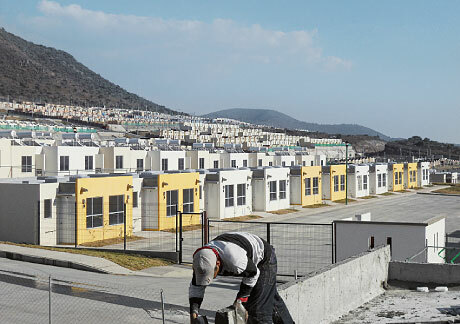 Its lightweight alu­mini­um pan­els and op­ti­mised forming se­quence de­liv­er greater ef­fi­cien­cy on the site. Doka One­Go is ide­al­ly suit­ed for many dif­fer­ent struc­tures, such as sin­gle fam­i­ly homes, hous­ing de­vel­op­ments and high­ris­es. 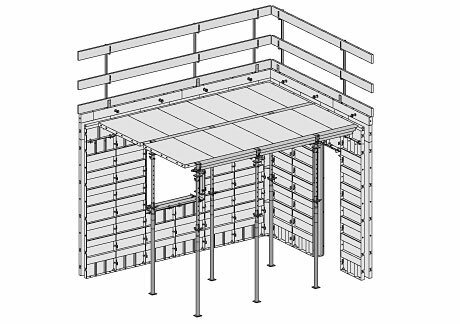 All components such as walls and columns, shafts, floors and down­s­tand beams, stair­ways and bal­conies as well as open­ings for win­dows and doors can be solved within the sys­tem. 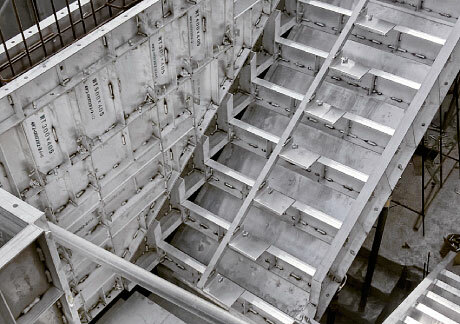 Doka OneGo is a monolithic formwork system for forming, casting and stripping wall and floor panels in a single operation. All components can be integrated into this step. The complete system can be assembled and repositioned by hand thanks to the lightweight aluminium panels. 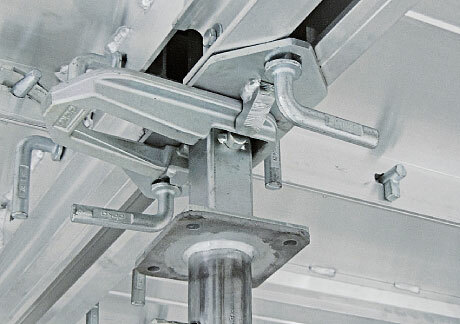 Wall panels are connected with wedge bolts while clips are used for joining floor panels; both connections are tightened with the OneGo hammer. They are anchored quickly and easily with flat tie-rods that also serve to define the wall thickness setting. Doka OneGo allows for forming all of the components. Not only can walls and columns, shafts, floors and beams windows and doors be solved within the system but also window and door openings. The corner areas of these openings are built with slanted OneGo box-out corners in order to make the stripping process easier here too. Stairways can also be built into the OneGo system so that the need for subsequent installation of pre-fabricated stairways is eliminated. 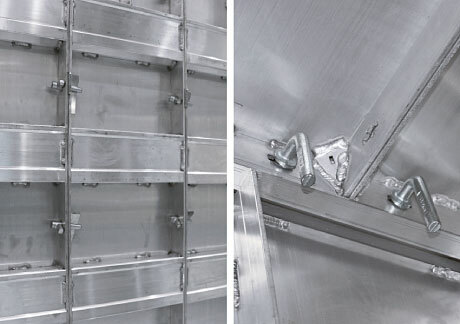 The forming process gets started in the corner area using basic elements; then the super lightweight panels can be connected one by one using simple wedge bolts. At the edge, the floor formwork is supported by the wall formwork so that only a few floor props are needed in the room any more. Stripping is supported by built-in stripping functions – bevelled basic elements, special wall/floor transition panels, stripping head in floor formwork. The stripping head supports the floor formwork via beams on which the floor panels are supported. It not only allows the floor formwork to be lowered but actively strips the floor formwork with its built-in pull-off function. Only a few blows of the hammer and the entire floor formwork is detached from the concrete. High reuse numbers are guaranteed thanks to the integrated stripping function for minimising wall and floor panel damage and also to reinforced connecting openings. 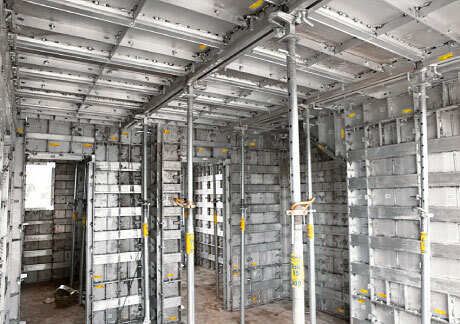 Doka OneGo is optimally adapted to the structure – improvisations are no longer necessary, something that saves time and money. Guardrail systems are easily assembled with the OneGo handrail post and protect the crew during the casting process. OneGo brackets can be used to assemble working platforms for safely forming and stripping additional storeys. Thank you for your interest - Doka OneGo. Thank you very much for your interest - Doka OneGo.